Academician Fan Daiming, vise-president of the Chinese Academy of Engineering, foreign associate of The Institute of Medicine and councilor of Chinese Anti-cancer Association, visited St. Stamford Modern Cancer Hospital Guangzhou on September 5th, 2017. Fan was escorted by President of St. Stamford International Medical Group Mr. Lin Zhicheng and General Manager of St. Stamford Modern Cancer Hospital Guangzhou Mr. Tu Xiaoming as he toured the hospital. Academician Fan Daiming(3rd on the left), President of St. Stamford International Medical Group Mr. Lin Zhicheng(3rd on the right). Academician Fan visited Minimally Invasive Room and Interventional Room, which are led by Professor Zhang Fujun, director of Committee of Minimally Invasive Therapy for Tumors of Chinese Anti-cancer Association. As a modern minimally invasive cancer hospital, St. Stamford Modern Cancer Hospital Guangzhou has applied dozens of minimally invasive technologies into cancer treatment practice for years, combining with traditional Chinese Medicine and other disciplines, which has gained extensive appreciation. The amount of minimally invasive operation for international cancer patients in St. Stamford Modern Cancer Hospital Guangzhou reaches 2500-2800 cases each year, ranking the forefront among cancer hospitals in China.
" Holistic integrated medicine is an inevitable direction for future medical development. It is not a tough but promising subject. Based on advanced medical technologies and integration of multiple disciplines, St. Stamford Modern Cancer Hospital Guangzhou succeeded in and insisted tailoring cancer patients individualized treatment plan, which was worth to promote.” academician Fan gave a positive recognition of medical works in St. Stamford Modern Cancer Hospital Guangzhou after tour to minimally invasive departments. In international tumor ward, when Fan knew that the average number of annual admission was up to 3000 international cancer patients and there were over 60 kind of value-added services provided in hospital, and doctors and nurses received over 600 thank-you notes from cancer patients each year, he nodded his head approvingly. Fan Daiming: Vise President of the Chinese Academy of Engineering, Director of Chinese Anti-cancer Association, Vise president of Fourth Military Medical University. Fan Daiming is a distinguished professor of the first Yangtze Scholars Program of the Ministry of National Education, a winner of National Funds for Outstanding Young Scientists and leading scientist of National 973 Project. He was successively responsible for National 863 and 973 Projects and National Significant New Medicine Research and Production as well as major subjects like National Nature and Science Funds and won numerous awards. He is the pioneer and promoter of Integrated Medicine. 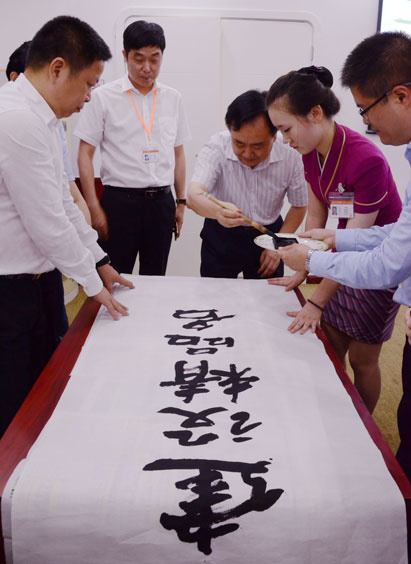 Chinese Anti-cancer Association: it is the most influential and the largest national association with the highest level of domestic cancer disciplines in China. The number of domestic individual members is more than 50,000 people. And it is the standing council of the Asian and Pacific Federation of Organizations for Cancer Research and Control (APFOCC), and member of Union for International Cancer Control (UICC).